Relax by yourself or share the moment with the new ASHENA Double Lounger by Sirio. This lovely lounger transforms from a sofa into a double chaise, or a day bed. It offers an aluminum inner-frame construction and an enhanced under-frame strap support for a softer, more comfortable seat. The all-weather resin wickers unique design allows for a configuration that meets your needs. The nice Cerulean Blue cushion is made from eco-friendly fibre and covered by olefin fabric for easy cleaning and fast drying. The ASHENA Double Lounger by Sirio is absolutely perfect for those who wish to unwind! Relaxation is easy with the PJR-429-R Reclining Lounger from CorLiving. Featured in our Black and Silver Grey ultra durable fabric accented with a foam cushion, this versatile reclining lounger will create a comfortable spot to stretch out and relax on your patio. Featuring UV resistant materials, water repellent cushion and a black weather and rust resistant steel frame, this product is ready to withstand the elements of the outdoors. With a dark brown finish and a tan polyester fabric seat to complement many exterior decors, the Sling Chair is a great way to help transform your patio into an outdoor living or dining area. This stackable chair features a sturdy steel frame with a powder-coated finish and a durable, UV-resistant sling. Enjoy your outdoor space with the Hampton Bay Spring Haven patio furniture made with beautifully hand-woven wicker and durable steel furniture frames. 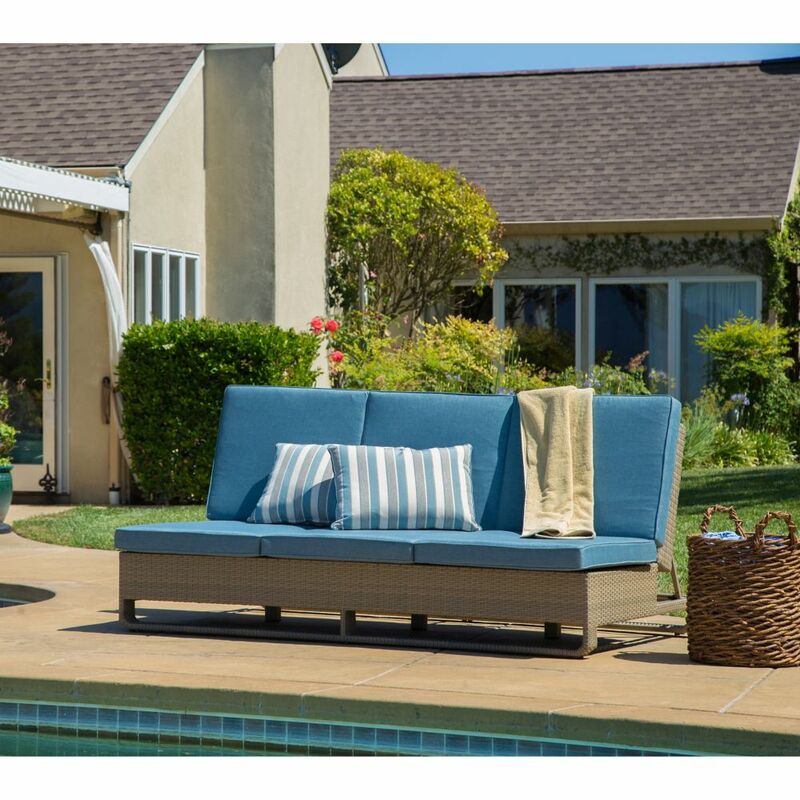 The patio 3- seater Sofa boast deep, plush weather resistant cushions for ultimate comfort and longevity. Perfect for your porch, patio or sunroom. Ashena Outdoor Double Lounger Relax by yourself or share the moment with the new ASHENA Double Lounger by Sirio. This lovely lounger transforms from a sofa into a double chaise, or a day bed. It offers an aluminum inner-frame construction and an enhanced under-frame strap support for a softer, more comfortable seat. The all-weather resin wickers unique design allows for a configuration that meets your needs. The nice Cerulean Blue cushion is made from eco-friendly fibre and covered by olefin fabric for easy cleaning and fast drying. The ASHENA Double Lounger by Sirio is absolutely perfect for those who wish to unwind!